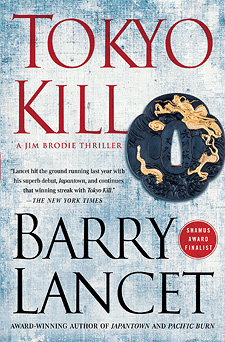 TOKYO KILL is the second Jim Brodie novel after JAPANTOWN, which has received three nods for Best First Novel of the Year and has been picked up for a television series by J. J. Abrams, of Lost and Star Trek fame, among many others. In TOKYO KILL, Jim Brodie returns for another outing. Brodie is a Japan expert saddled with half-ownership of a P.I. firm his ex-MP father left him in Tokyo. But his main line of business is an antiques shop he owns in San Francisco. He’s an American who happened to be born in Japan to American parents, so he spent his formative years in the Japanese capital, where he learned the language, the culture, and the mindset of the people. In TOKYO KILL, he returns to Japan for some long-overdue R&R after the trials of the Japantown case. He is soon caught up in the life of an old Japanese World War Two veteran, who claims Chinese Triads in Tokyo are killing off the last of his old war buddies one by one. Brodie takes a liking to the kind old army vet, agrees to help, and soon finds himself neck-deep in long-buried war secrets, far-too-clever spies, deadly kendo martial artists, guys wielding butcher knives, and one brutal murder too many. 2. Can you give us a sense of what you're working on now? I’m wrapping up the third Jim Brodie mystery, which, like the first two, will explore original territory. This time the topic is current and very alarming. I can’t say more than that now. I’m sworn to secrecy. Two things wrapped into one. Being able to get out of bed, come down the stairs, turn a corner, and be at my desk. No more Tokyo commute, sardine style. No more nine to five with endless meetings. No more being chained to an office desk. All that—AND I get to write what I want. It’s brilliant, and I’m having great fun writing the books. Before I began writing full time, I was a book editor in Tokyo, where I’m still based. I worked for one of Japan’s biggest publishers and acquired and developed books in English that we sold around the world—the U.S., Europe, and elsewhere. It was a great job (despite my answer to the previous question) and allowed me entry into many traditional and cultural worlds most foreigners and Japanese never see. Every place I went, everything I saw, and every bit I learned is now potential material for the Jim Brodie series. I hadn’t really thought in those terms, but that’s the way it’s turned out. Even though it was a great job, there was a downside—far too many meetings, some of the world’s nastiest office politics I’ve ever run across, and a number of other oddities. But those, too, have or will probably find their way into the books in one form or another. That’s as bad as it gets for me, which isn’t too bad at all. To publishers, I’d say, be more proactive. When impressive new ideas come along like GoodReads, bring it in under your umbrella to promote reading and books. The lines have been blurred. Strengthen your positions. Make some acquisitions jointly if you have to, but be adventurous and forward looking in your thinking. Don’t let the growing number of online purveyors snap up all the good publishing-related sites. 6. Are there two or three forgotten mystery writers you'd like to see in print again? Until recently, my answer to this would have been “James McClure,” author of the Kramer and Zondi series set in apartheid South Africa—nearly as foreign as the culture of Japan I write about. These were also written while apartheid was still being practiced. Fortunately, the good folks at Soho Crime rescued his works, and have put them out one by one. So I’d like to say, buy them and keep them in print! 7. Tell us about selling your first novel. Most writers never forget that moment. My first choice for an agent, after a number of false starts, was Robert Gottlieb, of the Trident Media Group. Yes, that Robert Gottlieb. I didn’t think I had a chance, but I sent off a query letter, received a request for the first fifty pages, sent that off too, and then received a second request for the full manuscript. A short time later Gottlieb called me in Tokyo from New York, and said he wanted to personally represent me if I was interested. You can guess my answer. The call came at about twelve midnight, Tokyo time, which was about ten in the morning in Manhattan. I’d been nearly ready to hit the sack, but after the call I stayed up for three more hours—in the company of some good scotch and saké. That was a very good night. The next call came from Sarah Knight at Simon & Schuster. She edits the work of James Lee Burke, Stephen Hunter, and acquires the works of experienced and new authors. I was still in Tokyo, and Knight, like Gottlieb, called from New York. Again around twelve. She was interested in the book, and we talked for nearly an hour and a half. She knew JAPANTOWN backward and forward. Even though I’d worked as an editor, I was impressed with her attention to detail. She was sharp, insightful, enthusiastic, and came up with some surprising observations. A day or two later she made an offer, for one book and as the negotiations progressed, she upped it to two. I stayed up even later that night, and I believe there was substantially more libation involved. 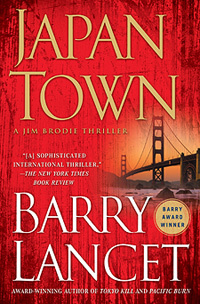 Barry Lancet's first mystery-thriller, JAPANTOWN, was the result of more than two decades of living in Japan as an expat American. His work in Tokyo gave him inside access to many traditional and business circles most outsiders and Japanese are never granted. JAPANTOWN has received three citations for Best First Novel, and has been optioned for a television drama by J. J. Abrams. Lancet is based in Japan, but visits the U.S. frequently. Simon & Schuster has signed him up for two more books after TOKYO KILL, both to feature Jim Brodie. For more information, please visit http://barrylancet.com/ or look for Lancet on Facebook and Twitter (@barrylancet).